Minutes from the airport, Tempe Beach Park and Arizona State University, the refreshed and expanded SpringHill Suites Phoenix Tempe/Airport is a stylish all-suites hotel designed for extended stays or quick jaunts. Our studio suites come with luxurious bedding, work area, sofa bed, and separate areas for sleeping, working and relaxing. At our hotel near Phoenix airport, you'll find special amenities that make you feel at home, including free local calls, Internet, mini-fridge, microwave and coffee maker. Relax in our redesigned lobby or work out in our expanded exercise room overlooking the pool! Start your day with a complimentary Breakfast buffet. Enjoy the many recreational activities near the hotel during your stay. 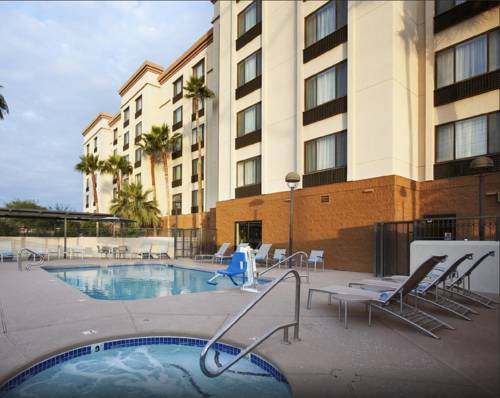 At the SpringHill Suites Phoenix Tempe/Airport, we will make your trip memorable and carefree.